KOPLAYER has always been one of the most popular Android emulators since it was first released. Although it has received stiff competition from other emulators like BlueStacks and Nox App Player, it continues to be one of the most used emulators today. The developers of the KOPLAYER emulator has now come out with KOPlayer APK Install: a brand new software that is used for downloading APK files and installing them on your Android phones. With their past success with KOPLAYER, will this new software be able to live up to the high expectations? Get Downloadable APKs, Your Way. For Free. First of all, downloading the KOPLAYER APK Installer file was easy and quick. The file wasn’t that big so it was finished in an instant. Once the download was done, all it takes is a few clicks and the installation is finished. Upon installing and launching the software, the user will now be taken to the KOPLAYER APK Installer window. The window is really small and it takes up very little space on your screen. There are no indications that the window can be enlarged. This is actually a bit of a problem since the software has a lot of tasks and features that need a lot of space to be fully displayed. The window itself is composed of four tabs on the left-hand side and a viewing space in the center. The first tab is the Download APK tab. This tab is where a larger window would have come in handy. The window can only display six downloadable APK. What’s even worse is that when you search for APKs, you have to view all of the information of the APK in a really small window. This is a minor inconvenience, but an inconvenience nonetheless. The second tab is the APK Install tab and this is where you can install your downloaded APKs to your Android device. The last two tabs serve no actual function other than to get users to download the KOPLAYER emulator and visit the forums. An additional feature is the Download button at the bottom left of the screen. Clicking on it will show a pop-up with the progress of your downloads. Downloading the APKs with the KOPLAYER APK Installer is easy. All you need to do is search for the APK you want and click on download. Depending on your download speed, it’ll be done in a flash. It should be noted, however, that the library of games in the software is limited. The really confusing part is installing the APKs to your device. It involves connecting your device to your PC via USB. Luckily, KOPLAYER does have an active forum where you can find support and instructions on how to do it. If all else fails, you can always use the KOPLAYER emulator to still play the game. 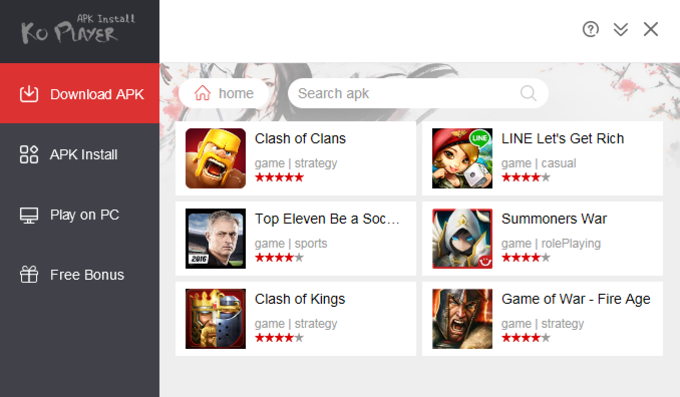 The KOPLAYER APK Installer is a program that does exactly what it’s supposed to. The downloading process is quick and easy. Users might have a bit of difficulty when it comes to installing, but there are instructions to help them online. Still, it’s not without its flaws. The small window is probably the biggest one. All in all, it’s still a pretty good software for downloading APKs. KOPLAYER APK Install is a permanent free and Ad-free utility for your PC. You can download all applications of Google Play and synchronize to install them to your Android phones without limitation. What do you think about KOPLAYER APK Install? Do you recommend it? Why?